This year marked a special point in our little man’s life. He would be 4 years old. This age brings a lot more autonomy and some admirable (and sometimes stubborn) certainty over what he likes and wants. For me as a cake-making-mommy it can be a little scary opening up the cake decision to a little person with big ideas. My concern wouldn’t last long, he wanted a mountain bike birthday cake and I knew I could deliver! Mountain biking is a favorite hobby/sport of the men in my life. For more on that specifically, see my other post Married to a Mountain Biker. Back to the baby’s birthday cake. He has been blazing his own trail for almost 2 years now. To mark his skills and his special day I knew the cake had to be special from the recipe on up to the decorations. I resorted to my favorite online baker’s cookbook Nerdy Nummies. I admire her skills and entertaining self and had not yet made any of the recipes so now was the perfect time. The Nerdy Nummies Cookbook had two components that would get me off to a good start for this mountain bike birthday cake. The rich chocolate cake recipe and the “dirt” recipe for the decoration. I knew I had to use my chocolate whipped cream/cream cheese frosting of course. With the cake essentially planned out, it was time for the cake toppers and other decorations to complete the plan for this mountain bike birthday cake. 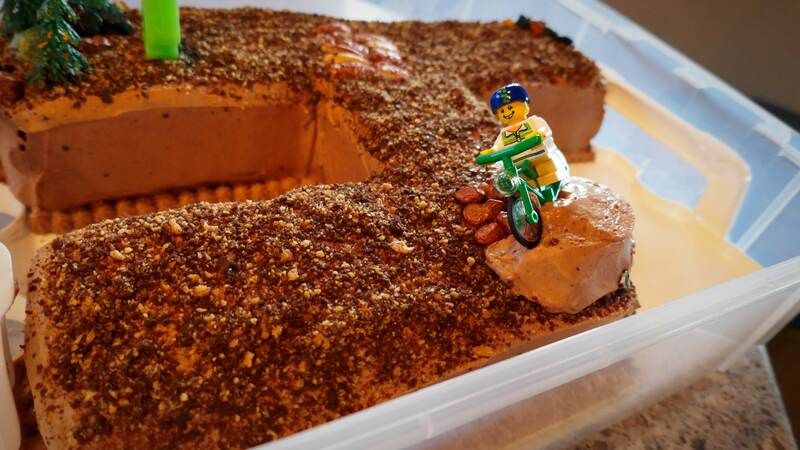 My tiny mountain biker had to make an appearance on his own cake of course, plus some trees, rocks and berms. I fashioned a mountain biker from a trip to our local Lego Store, ordered these trees on Amazon, and picked up some chocolate rocks at Lolli and Pops. Since my baking usually consists of cupcakes, I needed a cake pan too. 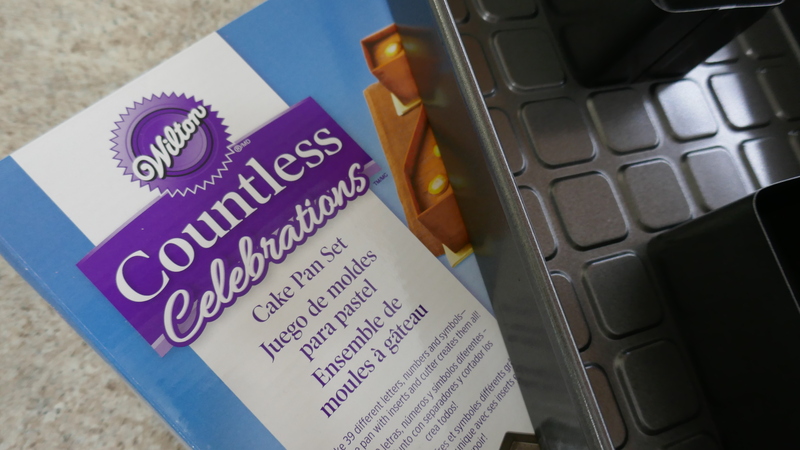 The Wilton Countless Celebrations Cake Pan Set was perfect! I could make the cake shaped like a #4 for my little man. Sold! 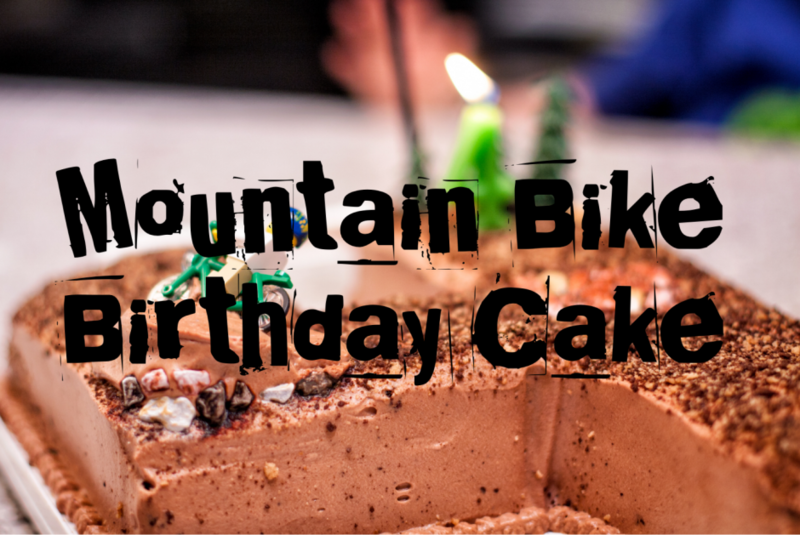 With all items gathered, and the birthday upon us, it was time to make this mountain bike birthday cake! 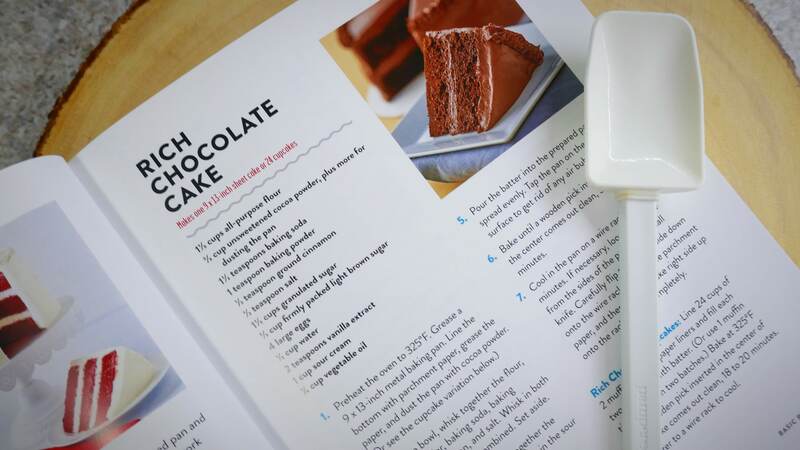 Follow the setup instructions included in the cake pan set to set up the pan for the desired shape. Make sure to spray it with nonstick spray! And I mean spray it like you’ve never sprayed a pan before. You want to be super generous with your nonstick baking spray with all the corners you’ll have to get the baked cake out of later. Time to prep the batter! 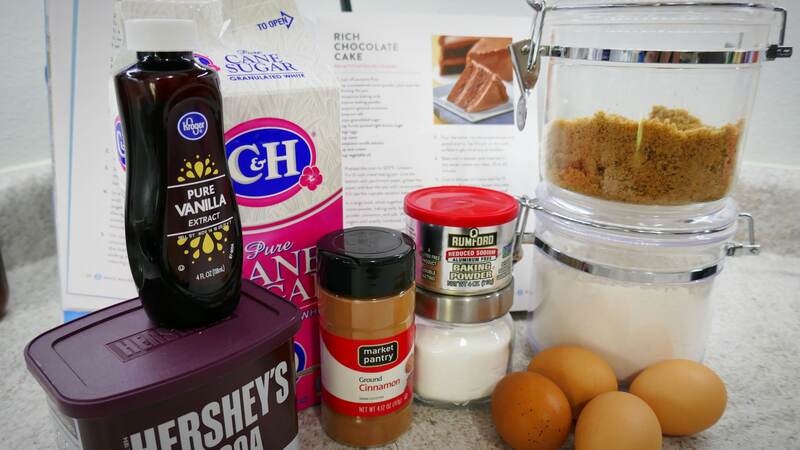 The rich chocolate cake has some typical and some unconventional ingredients. The 2 ingredients that make it unconventional from other batter recipes I’ve used is the cinnamon and sour cream. Yes, sour cream. I was so surprised by it I didn’t even have it out with the rest of the ingredients gathered! 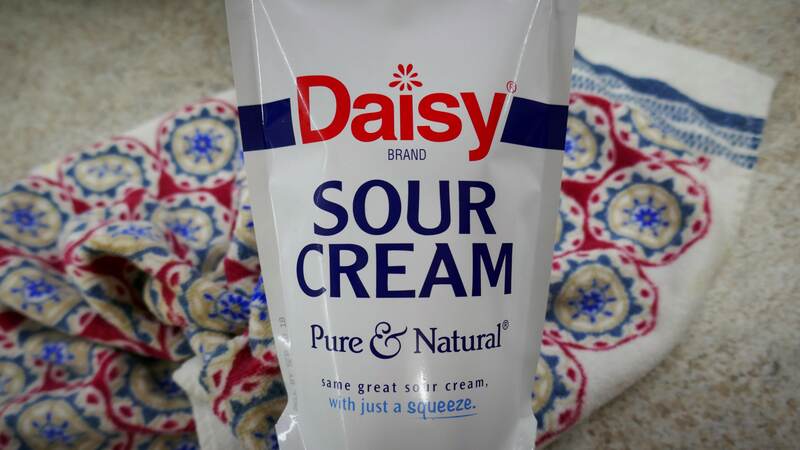 Don’t worry, sour cream, you got your own spotlight. I believe you are the key reason this cake turns out so rich and moist. The batter is super simple to make. Mix the dry ingredients together in one bowl. Mix the wet ingredients in another bowl. Add the wet to the try. Mix to combine and pour in pan. The photo above captures the ingredients list and directions. Bake according to your pan or until a toothpick inserted comes out clean. The birthday boy himself helped with the next steps. While the cake was baking, we prepared the “dirt” crumb topping. I changed this recipe up a bit, because the book called for dismantling oreos and then crushing. Well, here at Just Be Slower we like things simplified. Besides, dissecting oreos sounded like abuse of perfectly good cookies. 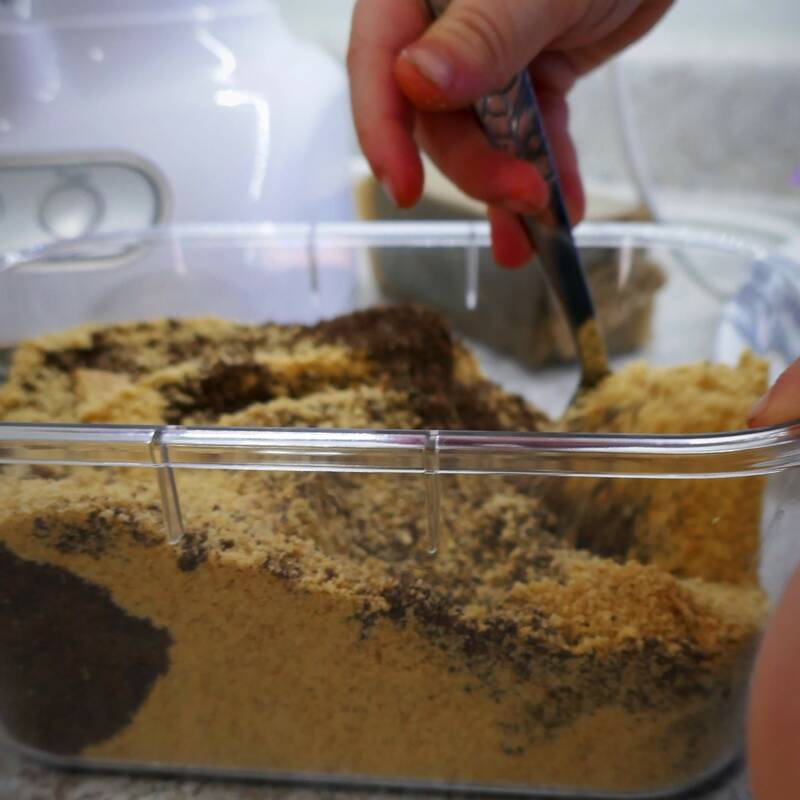 So we made our “dirt” out of honey graham crackers and chocolate graham crackers. Buy one box of each flavor. Inside a standard box of each are 3 wrapped packs of crackers. Add one package of the honey to a food processor and pulse until crumbed. Pour into a bowl. Next add one package of the chocolate to the food processor and pulse until crumbed. Add to the bowl with the honey crumbs and stir until combined. Have you ever seen such perfectly delicious dirt? It was so simple and did actually taste good. We had some leftover and used to sprinkle into some plain yogurt after. The time has come to put this whole mountain bike birthday cake together. Remove cake from the pan and cool completely on a cake board or your serving plate. Frost all sides. Time to map out a mountain bike trail. I used chocolate rocks to make a rock feature by pressing them in closely to each other. To create a berm, cut a donut in half and carve to shape the angle of the entry and exit. Place on cake and frost with your same frosting. 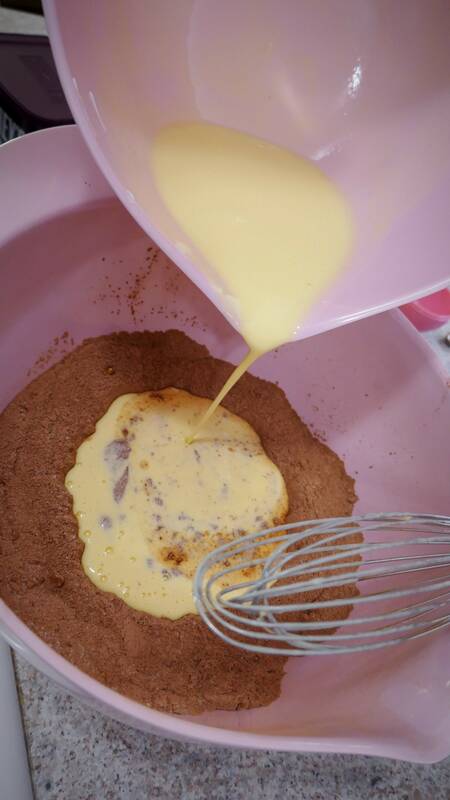 Sprinkle the whole cake with your dirt crumbs. Add other chocolate rocks and your plastic pine trees around your cake. Add the finishing touches such as your figure and birthday candles. All done! All that’s left is to sing and enjoy! For us it’s not a birthday cake without the birthday boy or girl’s name on it. I’ve ordered these custom name cake toppers in all my family’s names to use for any birthday yet to come. It is a simply perfect way to personalize a cake. I even used it on a cheeseburger for a birthday girl once! But back to the mountain bike birthday cake. This cake impressed on both style and flavor. 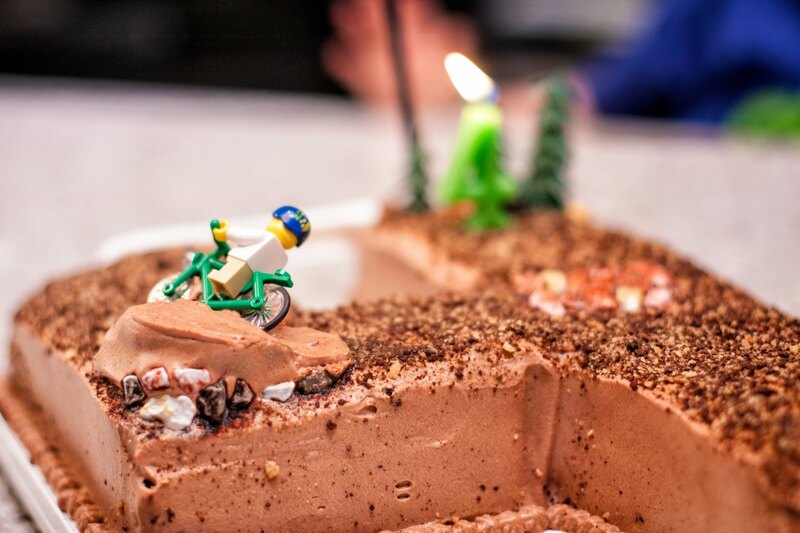 If you have a mountain biker in your life, make this cake! It will impress them the way they impress themselves watching their “sick jumps” back on their GoPro. Even if you don’t, still make this cake! The cake is rich while maintaining light and fluffy goodness.